One of the gals in my DJ mini group suggested we do a 4 patch swap with reproduction brown and pink. I love how one simple four patch can be made into so many different quilts! 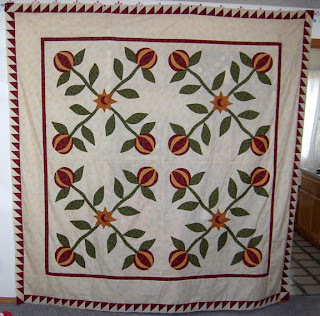 I believe this is just one of the quilts Jill made with her 4 patches. She chose to showcase her beautiful machine quilting skills. This is Susan's. I think this is only one of her tops too! Love that toile. I have been lucky enough to go quilt shop hopping in Pennsylvania Amish country. Last fall I met up with my friend in Ohio and we had a fun road trip. I showed photos from the Harrisburg quilt show on a previous post. The shopping topped that for sure! Have you ever seen such a beautiful setting for a quilt shop? It seemed like we traveled back roads to get there, but I think it was really the scenic route! Burkholders Fabric- in the middle of a corn field! Just looking at the photos makes me want to go back. This was part of the motivation for a trip. A truckload sale at Sauders! The prices cannot be beat! Please tell me where you can buy a Moda bolt of fabric for about $2.oo yard and I'll plan a trip!! The whole place is jammed packed and prices are unbelievable. There were a whole lot of shoppers too, but I was prepared for that, making sure I was in no hurry. Everyone was very friendly and chatty. Here is the loot I brought home. I also jammed a priority mail box full of my clothes. When I arrived at the airport my checked bag was 1 pound over! I think I grabbed a pair of shoes out and added that to my super heavy carry on. If you click to enlarge you can see 3 bolts of fabric. The basket, the wooden bowl and the little crock all came home with me. Fun, fun memories!! This sampler was from my very first quilt class. My Sister in Law talked me into taking it and I've never looked back! Jean Wells, owner of the Stitchin' Post was my first teacher and I couldn't have had asked for better. We had so much fun and she was laid back enough to give me the attitude I have now. We learned so many techniques, that I do treasure my first humble sampler. I also machine quilted it myself and hated every minute of it!!! This was my last sampler from a swap. I am seeing a trend with the swap quilts. I gave it away to my mom for Christmas. I made it back safely and my mom is officially moved. I haven't decided if that is a good or bad thing yet. This will be the closest I've lived my my mom since I was 13 years old! For my piece of mind and her safety I know the move will be positive. I've been involved in a few block swaps, but when it comes to sampler quilts I'm not a huge fan. It is fun to be a part of the group so I participate. I love the floral fabric for the setting triangles in this one. None of the actual blocks use this fabric but I think it works. This one is flannel and I added the green corners because I ran out of paisley fabric. The individual blocks were fine, but I didn't want to look at the completed quilt for too long so I gave it to my brother!!! These two little quilts were made by Tonye Belinda Phillips. Aren't they just adorable? She was teaching the week prior to the show. I think I may need to sign up for a class at the Stitchin' Post. I don't make many quilts with the 30's fabric but they sure are sweet. I love plaids and homespuns! Simple patterns are perfect for them. 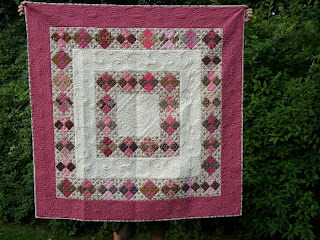 I love scrap quilts, but 2 color quilts draw me in too. This looks like a quilt made from AP&Q Shop Sampler magazine. It's a pretty simple quilt but I am really drawn to it. I'm not sure whether it is the colors or the medallion style. Of course, I'm a sucker for stars too! This quilt was made in the aftermath of hurricane Katrina. My niece and two nephews were living with us during that time and we had a lot of fun putting it together. I set up my extra machine and while the 2 oldest sewed, the youngest chose scraps and fabrics from the stash and attempted to iron. I supervised, pinned, cut, and ran the iron. I also did the quilting. They were thrilled and so happy to have a part in helping others. I think we got it done from start to finish in 2 or 3 days. I am a very visual learner. There is nothing like seeing what someone is trying to explain. I thought I'd do a step by step pictorial on how I spray baste my quilts. I do not profess to be a photographer, so please just visualize nice photos while looking at my snapshots. Using a spray to baste your quilts is not for everyone, it is just what works for me. Make sure you do it in a well ventilated area. When I did this on Thursday from start to finish it took about 40 minutes. Start means pulling my car out of the garage and finish means removing the tape and folding the quilts. I've tried many basting sprays and am completely sold on Sullivan's. It seems a little harder to find these days, but it's worth it to me. Find yourself a nice open space; large enough to spread out your backing. I use my garage floor. It's impossible in the winter because of the snow that comes in with my car. But things have dried out now. Sweep well! Lay your backing wrong side up and using masking tape (I was out, so I used scotch-the quilts were small enough that I could get away with it, anything bigger and I would have made sure to use masking tape) start at one end and put about 3 pieces of tape to hold down the backing. Move to the other end; tape it also pulling lightly to smooth. 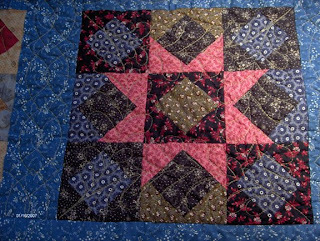 Move to the sides and continue taping around the perimeter of the quilt. The larger the quilt the more tape you may want to use. My backing doesn't look very smooth here, but it isn't that big so I wasn't going to fret too much. Now, pull the batting back about 1/2 way. Use your spray baste and spray, according to the directions, the batting and the backing that is showing. Fold the batting back over and smooth from the center out onto your backing, making sure there are no lumps or wrinkles. If there is, just lift and re-press. Make sure it is smooth. Now, fold the batting over from the other side. You will know about how far to fold it over because it will be a bit sticky where you've already basted. Spray both sides, fold over and smooth. Fold back about 1/2 way, spray your batting and quilt top. Fold back over and smooth. Make sure there are no lumps or folds! Then you will fold back the other side and do the same thing. Fold top back on batting and smooth out so everything lays flat. Ta-Da! Remove tape and you are ready to quilt! Personally I don't use the spray if I am handquilting as I think it would be difficult. No matter what size, I do them all the same way. Let me know if you need any clarification. Was this helpful? Here is another quilt my DJ group has done. 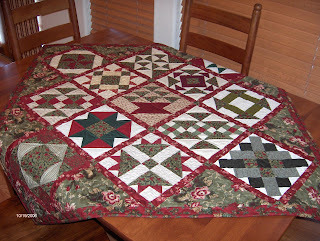 It was called Hidden Stars and was in American Patchwork and Quilting magazine. I love that you can see the stars in some of the blocks and depending on the color placement you really have to search for them in the others. I don't profess to be a great quilter but I sure can't afford to send them all out!! P.S. 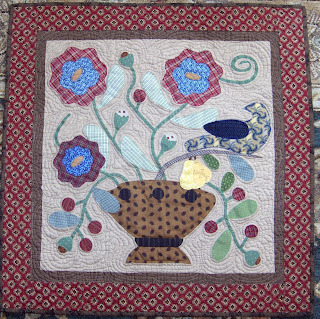 It is in the February 2006 issue of American Patchwork and Quilting. Here are a couple of quilts my DJ mini-group(the same as the Urn pattern project) and I have done together. This is the Round Robin we did. Yikes! A feathered star center and hand quilted by me...which took forever, but I am really pleased with it. I started the Row Robin with the sawtooth-in-a-sawtooth stars on the top row. 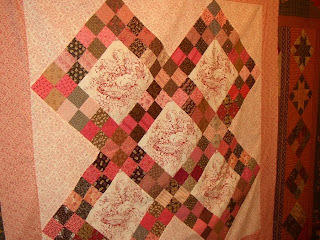 This was done in Civil War reproductions and machine quilted by me. Here was a fun easy project that I did with a group on Yahoo. One of the members designed it so I'm sure it was fun for her to see how the group interpreted her pattern. My background looks pretty washed out in the photo. It is actually a medium tan. I took a string quilt class with Gwen Marston 3 years ago at The Stitchin' Post and here are a few of her quilts. She is a fun laid back teacher and I enjoyed her class a lot. Here is another I love to display when I am so tired of winter and know spring will be here soon. This is by Country Threads. 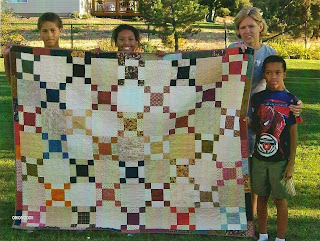 Quilted by Bonnie Hunter. OK, I really just love quilts, but I also love quilts with houses on them! I can't say that I love the top one. It is an old project- so old that the blue border has faded to purple. Because I wasn't in love with it, I used a fabric pen to write the letters instead of embroidery. I am pretty sure this is by Jan Patek. This next one is a little Thimbleberry project that I have on my table during the holidays. I love this one! 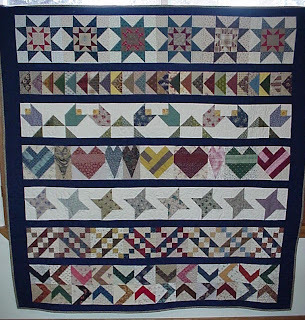 This is a house sampler quilt, by Country Quilts. They have the cutest quilt patterns!! All of these were machine quilted by me. Here is the latest quilt shop applique. The blocks were pretty big so it wasn't as difficult as it might look. Except for the beastie block in the center!!! This took some time for me to figure out. The directions in the book were very complicated and probably really needed to be hand sewn. I figured out an effective way to applique it on the machine. I loved this quilt the minute I saw it. I machine stitched the large pieces using invisible machine applique and clear thread. The pieces were huge so it was easy. It had some really large places in there so my friend, Kat, showed me how to to "fake" trapunto using washable thread and a piece of poly batting. I knew I needed an expert quilter and so we bartered. She quilted it for me and I made her a pomegranate quilt top! Pictured below. This block was going to be a 4 block quilt. I'm sure it would have looked a lot better had I continued. (I think it looks really unbalanced) I took a Folk Art applique class with Gwen Marston based on her book and it was great. I learned a bit about making my own flowers and leaves and a few design elements. It seems like her main emphasis was not to worry about being perfect. Looking at old quilts lets us know not everything was symmetrical or all the same fabric and ours doesn't have to be either. I've never been a part of the quilt police and feel very comfortable doing my own thing. I may not always like the end result but I almost always like the process. This is on my machine quilting list. I saw this in some Country Home book from the library. 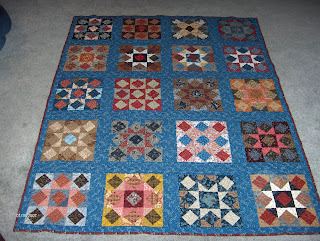 They actually pieced together 5 blocks from an old quilt. I used three to fit my table. Machine appliqued on old flour or sugar sacks and because it was supposed to be prim and folksy I only quilted between the blocks to help hold it together. Is There a Method to My Madness? !